Collection of the great southern soul vocalist. bio info: James Carr (June 13, 1942 - January 7, 2001), was an American Rhythm & Blues and soul singer. Born to a Baptist preacher's family in Coahoma, Mississippi, Carr began singing in church and was performing in gospel groups and making tables on an assembly line in Memphis, Tennessee, when he began recording in the mid-'60s for Goldwax Records, a small Memphis based label. Carr first made the R&B charts in 1966 with "You've Got My Mind Messed Up", followed by his most famous song "The Dark End of the Street", written by Dan Penn and Chips Moman. 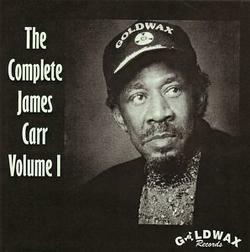 Carr continued to record for Goldwax until the label closed in 1969 but failed to reach the same heights with his subsequent releases. Carr suffered from bipolar disorder for most of his life which affected his career. This was evident during a tour of Japan in the 1970s when he froze in front of an audience following an overdose of antidepressants. However he completed the Japan tour with much success. A resurgence in interest in his music, spurred by his portrayal in Peter Guralnick's 1986 book Sweet Soul Music, helped return Carr to the recording studio but failed to deliver any further chart success. James Carr died from lung cancer in a Memphis nursing home in 2001, aged 58.